Desiccation of disk: With increasing age, changes occur in the composition of both the nucleus pulposus and the annulus fibrosus (3, 9, 10, 17). Mechanical stresses imposed on the disk, as well as the relatively inefficient provision of nutrients to the cells in the disk caused by the poor vascularity of the area, likely precipitate these changes. Progressive dehydration of the nucleus and degenerative granules develop in the fibrocartilage and areas of neovascularity, and chondrocyte proliferation arises. Furthermore, tears can be found in the annulus and the endplate, in addition to chemical changes in the composition of disks (4, 10, 17). There is a decrease in the amount of proteoglycan in the nucleus, the large aggregate molecules fragment, more keratin sulfate is present, collagen subtypes change, and inflammatory mediators can be detected. These all contribute to desiccation of the disk and possibly increase the risk of DDD. Apophyseal ring fractures: The apophyseal ring is attached to the annulus fibrosis; it usually ossifies in children between the ages of 4 and 6 years and fuses at 18 years (33, 38). An osteocartilaginous portion that insinuates between the vertebral body and apophyseal ring is weak and susceptible to repeated stresses. Hence, apophyseal ring fractures associated with disk herniation are seen almost exclusively in children (23). Disruption of this zone can easily occur with moderate shearing forces. These fractures may result from lifting a heavy object but may also occur from falls or twisting injuries. Many patients with apophyseal ring fractures describe a “popping” sound concurrent with the onset of symptoms. Diagnosis is confirmed with MRI and/or CT to delineate the pathology and anatomical defect at the endplate of the vertebral body. 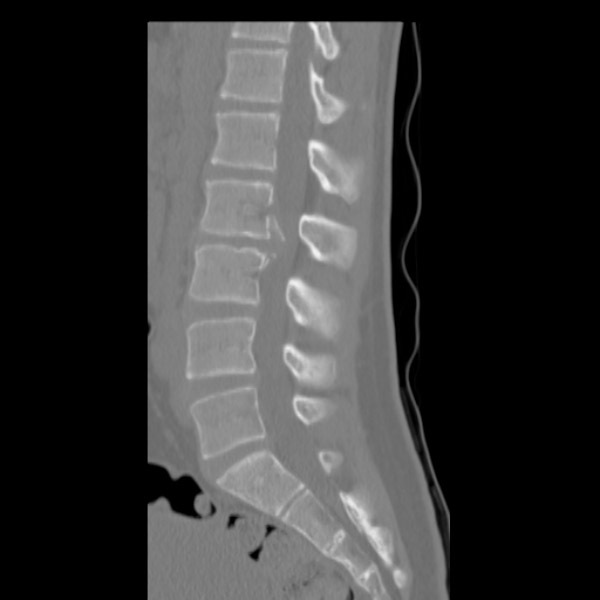 Sagittal CT scan of a L2-3 traumatic disk herniation: CT scan in a 14-year-old boy showing the presence of calcified apophyseal ring injuries.